Casa Paloma in Sayulita is a spectacular oceanfront estate that will take your breath away! 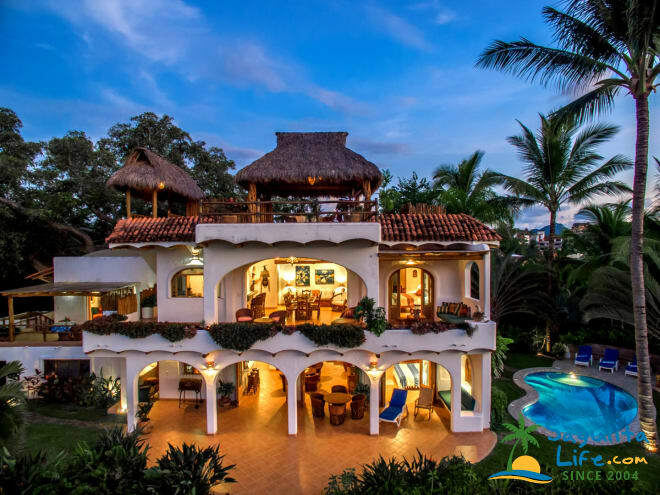 It's 6 bedroom suites with adjoining baths, heated pool, 3 kitchens and 2 living rooms, incredible tropical gardens and unsurpassed unobstructed 180 degree ocean views will initiate a love affair with Sayulita you will never forget. 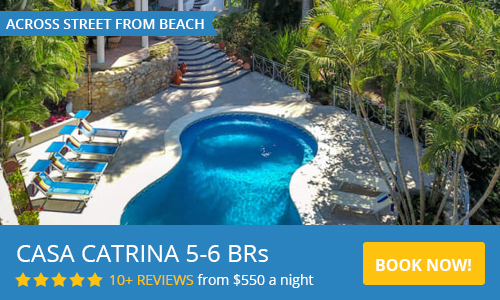 Casa Paloma--NOW A 6 BEDROOM, 6 BATH HOUSE--is in the perfect Sayulita location - directly above Sayulita's main beach and surf break and ONLY 1 1/2 blocks away via a beautifully paved landscaped walkway. Watch the surfers, birds and whales and sunsets. And be lulled to sleep by the sound of the surf! You also have immediate access to the town plaza, just 2 blocks away. Casa Paloma is 1 of 4 DREAMER CIRCLE PROPERTIES - all luxury villas with pools right next to each other. The tranquility of Casa Paloma in Sayulita all comes together through an exceptional collection of colorful artisan objects that pleasantly recreates the Mexican spirit of life on the coast. 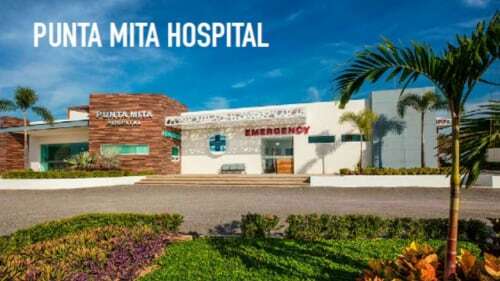 It has 3 tiled kitchens and 6 tiled bathrooms, in addition to 2 outdoor showers, a pressurized water system with filtered drinking water, memory foam mattresses, A/C, WiFi, flat screen HD TVs for DVD use only, DVD and CD players with Ipod connections plus libraries, 100% cotton sheets, plus so much more. Our professional staff is outstanding in its kindness and service. A cook and/or masseuse can be provided. There are verandas, decks, terraces and patios on 3 different levels - allowing for maximum privacy or large gathering areas. Ideally located only 1 1/2 blocks to the surf beach and town center, Casa Paloma is the tropical home of your dreams. The lush enchanting private gardens, gorgeous unparelleled 360 degree views, heated ozone-treated pool (no chlorine) with ocean view (plus a small wading pool for the little ones) and striking Mexican art thoughout, make this unique property a Sayulita getaway you will never forget. PLEASE VIEW OUR CALENDAR - IT ACCURATELY REFLECTS AVAILABILITY! Need more room? We have three other homes next door that can also be rented to accommodate large groups. Together, these four exquisite homes make up Dreamer Circle Properties, Sayulita's best option for your large group in Sayulita's most sought after neighborhood. To view our three other homes next door, visit Dreamer Circle Properties, Sayulita's perfect option for your large group in a great location. These owners have superb taste, I could easily live here! :) Plus they made us feel very welcome. Amazing views, super comfortable beds, and gallery art on all the walls. A 5 minute stroll to town or beach. Locals are very friendly, the food is cheap and delicious. Would definitely stay here again, in fact, already planning on it! Had a wonderful vacation December 2017. Casa Paloma is a beautiful and comfortable home with THE most INCREDIBLE views of Sayulita's coast. The house was spacious for our group of 10 -- we all had privacy as well as the ability to spend happy time together. AMAZING LOCATION. Such a lovely, and easy, walk down the hill to the beach and town. Ernesto (the property manager) and Dora (the house keeper) were great. It was truly a pleasure to be hosted by such happy and honest locals. And we felt extra-safe knowing there is a security guard who patrols the 4 Dreamer Circle houses every night. Ernesto arranged our transportation and the drivers were good (and safe). The whole experience left me wanting more. I am dreaming of returning again soon!!! We were in Sayulita in early November for our wedding and had some of our family stay in all the houses of Dream Circle Properties. Casa Paloma exceeded our expectations! The view is incredible, it is walking distance from town and all the rooms are comfortable with AC. I was concerned it may seem crowded with couples in every room, but there is plenty of space for everyone. We will definitely be returning! We had a such great time staying here with our family. Close to town, close to the beach, and the best view ever! Couldn't have been happier with the house, the staff was super helpful and location great. The house is absolutely magnificent. There were six adults going in six directions. We would all return to this magical place to enjoy each others company. Ernesto, Dora and husband made the dinners such a great experience. We rented Casa Paloma for one week to go to my daughter's wedding and were very happy with the house, beautiful views and the location. The house is less than a 5 minute walk to Sayulita town plaza. There were 12 people in our group and the other wedding guests stayed in the houses adjacent. The house manager Ernesto, was very helpful and came by to check on us everyday. 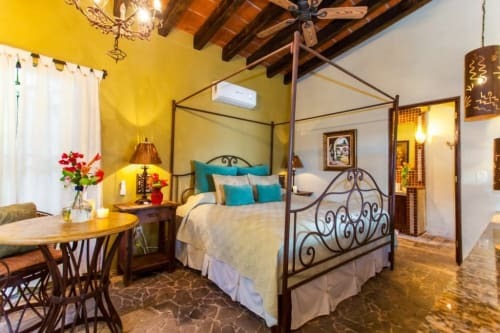 We would highly recommend this house to anyone visiting Sayulita. The house is so well located to the town. It has such a beautiful view. The staff is great. Our family had a wonderful time!! As I reflect on the time I've spent at Casa Paloma, in Sayulita, Mexico, only about 2 weeks ago, it brings great joy to my heart! The owners of this fabulous estate have brought consideration to every nook and cranny with their architectural insights, interior design skills, and artistic creativity. Every room was a delightful exploration of light, color, artistry, imagination, and culture. Each room had an exquisite balance of indoor simplicity and beauty opening up to a heavenly assortment of outdoor gardens, lounges, skies, stars, and spectacular ocean views, etc. etc. etc. Even if it wasn't a short and lovely walk to the town where the markets, shops, restaurants, and village square are a bundle of joy and excitement; even if it wasn't a short and lovely walk to the beach where you could be a beach bum, get a tan (or burn if you chose), and watch the surfers endlessly, or go surfing yourself, or snorkeling; even if it wasn't a joy to see the Mexican culture at it's finest - enjoying life as they know it, and genuinely happy to serve us all; Casa Paloma would stand well on its own. I went with about 8 of my dearest friends and the spaciousness allowed us to gather as often as we chose, but also have the option of privacy in the most beautiful surroundings when wanted. We had an absolutely fantastic time! The owners have truly taken everything into account including your safety with exceptional security, your stay with a manager that can help with any and all aspects of your stay, and a housekeeping service that goes above and beyond. I've been in the remodeling business for about 3 years now, and have converted about 20 houses in this time from various levels of rags to riches, and I have to say I'm quite envious of the owners of Casa Paloma for the expertise they have brought to everything! If I was younger I would ask them for an understudy position!